It’s often said that in the moments before you die your life passes in front of your eyes. I’m sceptical about how true that is since anyone who’s had it happen to them is unlikely to be able to report back after the event. By contrast, I can believe that in their final days, the sick and dying probably do look back on their lives and think about the people they loved, the chances they missed and the things that might have been different if they’d come to life’s junctions and taken a different direction. 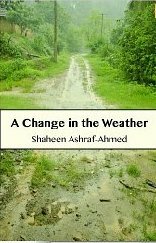 This is the theme of Shaheen Ashraf-Ahmed’s short story A Change in the Weather. An old man lies in his bedroom in India, gathering the people and things he loves around him. His wife’s oil paintings from their honeymoon in Kashmir hang on the walls and he remembers their first days together as man and wife. His granddaughter’s comic books sit on the shelf and he thinks about her coming to visit later in the day to laugh as she reads and to play her music. His wife of over 40 years has lined up all his medicine bottles and he lies by the window watching and listening to life go on outside. His son rolls up in his sports car and reluctantly discusses the arranged marriage his parents hope he’ll accept and an old friend visits to help him plot that son’s future. When his granddaughter picks up a book on his shelf – a Dylan Thomas – which has an inscription “R., for changing the weather of my heart, E.” on the fly-leaf. She asks him who are R and E and his mind drifts off to think about his youth. As the book flips back and forth between the London of his past and the India of his present, the absence of much of a future is at the back of our minds. Imran doesn’t tell us why things went wrong, why he left Emily behind or what happened to her. We’re left to discover that through a bunch of undelivered letters which Imran believes to have been destroyed many years before. As readers we’re left wondering if he took the right decisions, weighing up the happiness of his life with his wife and family against the life he could have had thousands of miles away. This is the second of Shaheen Ashraf-Ahmed’s short stories I’ve read and the first which she published as a Kindle e-book. This is not a book that will take you long to read but you may find as soon as you’ve finished it that you go straight back and read it again. I found subtleties the second time around that I missed the first time. I missed the revelation about why his son lost his parrot first time but it all made sense the second time. Ashraf-Ahmed’s short stories are great read once and even better repeated. Not everyone likes short stories and I’m not always a fan. Too often a short story is written because the author hasn’t got a big enough story to make a ‘proper’ book out of it but that’s not the case with this story. Fortunately Shaheen’s short stories are exceptional. They are tasty nuggets of life which leave the reader with plenty of unanswered questions and lots to think about. I enjoyed the snippets of Imran’s life in 1960s London with Emily as well as the finely crafted details of the minutiae of his elderly life. The pictures she paints of the room Imran lives in, the things he has around him and the family he loves are so strong that we can easily imagine we’re sitting on that hard chair in his room watching everything that happens. One Comment on "A Change in the Weather"